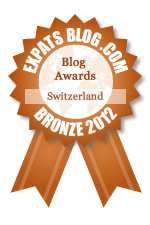 ExpatsBlog.com Expat Blog Awards 2012: Switzerland Bronze Award! I only wish this blog was around 4 years ago when I first moved to Geneva from London. it is a must for anybody seeking a little "je ne sais quoi" and fun family activities. It captures all that is cool, vibrant, and happening for families in and around Geneva, and showcases a Geneva that can hold its own on the world stage. In short, refreshingly fresh...Keep up the good work! I Love the blog, full of great tips and insights, it had inspired our family to go apple picking recently and try out some great restaurants we can enjoy with the kids. Deserves all the 5 Stars! Contemporary, informative and most importantly, I have never been let down by any of the ideas posted. Simply cool. Lived in Geneva for 7 years, wish there had been a site like this when we were there!